Amidst the sweltering heat of the tropics, there is a country called Vietnam. Previously known only for the tragic Vietnamese War, Vietnam shot to fame and became an adventure junkies' hotspot in 2009 when the largest cave in the world was discovered here. With its diverse and unique landscapes, there are a number of extensive, spectacular caves in Vietnam, and the best part is not all caves are discovered! That is probably pretty good motivation for the brave-hearted and experienced cavers to pack their bags. For the rest of us who aren't as experienced, Vietnam has more than enough smaller and less treacherous caves to explore. So, go pack your bags and get ready to explore! Son Doong Cave is not just the biggest cave in the world, it is also one of the longest caves in the world. Located in the heart of the Phong Nha Ke Bang National Park in the Quang Binh province, these caves are open only to a few people, every year. Hang Son Doong, literally translating into 'Mountain River Caves' is not only the largest cave in Vietnam but also one of the most spectacular ones. In fact, this cave is so hard to explore that fewer people have trekked into it than those who have climbed the Everest! The cave is over five kilometres long, 150 meters wide and more than 200 meters high. The enormous stalagmites rising up from the ground and the blithe stalactites from the ceiling, coupled with the rays of sunlight falling out through holes in the rocks, shroud the cave in an ethereal feeling. The Son Doong Cave is so large, it has forests inside it and an entire weather system of its own. The only tour operator allowed to conduct cave expeditions of this cave is Oxalis Adventure Tourism. The total trek duration is four days and three nights, in addition to the two days stay at local hotels before the trek. How to Reach - Phong Nha Ke Bang can be reached by Bus from Dong Hoi, (which has the nearest airport and railway station). It can also be reached by Bus from Ninh Binh or Cat Ba, or directly by renting a taxi or a motorbike. For the expedition, Oxalis will provide you with specific instructions to reach a meeting point. The Grand Cathedral like the entrance of the Paradise Caves beckons you inside. With its vaulted ceiling and spectacular stalactites, this cave lives up to its name. Paradise cave is 31 kilometres long, making it one of the longest caves in the world. Out of the 31 kilometres, the maximum distance that the public is allowed up to is 3.5 kilometres deep. In the rainy season when the water level is high, the expedition is up to a distance of 2 kilometres. You can book the underground tour of the Paradise Cave by Phong Nha Farmstay, Easy Tiger Hostel or Phong Nha Discovery. It is a day trip and you will be provided with a head torch by your guide to aid you through the journey. Other activities include Lunch inside the cave, swimming inside the cave and a skylight where natural sunlight shines through the rocks. How to Reach - From the turnoff on Route 20 which leads to the Phong Nha Park, it is 13.5 km. Then turn onto Ho Chi Minh Highway and travel 5 km to reach the entrance. The Tu Lan Caves, though not as large as the Son Dong Caves, has the most number of adventure activities among the caves of Vietnam. These spectacular caves have behemoths of stalagmites, accompanied by large limestone karsts. The cave is continuously irrigated with rivers and lakes. Oxalis is the only tour operator that operates in this area. The Tu Lan Caves is said to be one amongst the best caving experiences in the world and one of the most famous highlights of caving in Vietnam, with a myriad of activities including swimming, dark cave exploration, climbing, rappelling and zip lining. The expedition takes 4 days and 3 nights, in addition to one night stay at an exotic Farm Stay. This adventure plunges you into the forest way of living and incites your sense of adventure. How to Reach: Phong Nha Ke Bang can be reached by Bus from Dong Hoi, (which has the nearest airport and railway station). It can also be reached by Bus from Ninh Binh or Cat Ba, or directly by renting a taxi or a motorbike. For the expedition, Oxalis will provide you with specific instructions to reach a meeting point. Hang En Cave, the third largest cave in the world, will make you feel like you've been transported straight into a Disney movie. Located deep inside Phong Nha Ke Bang, this caves is surrounded by limestone mountains, jungle canopy and the gushing Rao Thuong River. The cave entrance is a slit in the cliff. The narrow trails continue for a long distance, terminating at an aquamarine lake with sandy beaches. The lake may seem to be the end point of the cave, however, a narrow path leads from this cave to a rocky outcrop with sunlight streaming on it, which you clamber up to view the breathtaking natural beauty of the arched exit. This 2 days 1-night trip includes swimming in the lake inside the cave, so packing your swimming gear is essential. The Dau Go Cave (Wooden Stake Caves) is the largest and most beautiful grotto in the Halong Bay area. Located about 6 kilometres from Bai Chay Wharf in Halong, this cave is 27 meters above the sea level. The entrance is 12 meters wide and 17 meters high. Inside the cave is a huge space with the size of 5,000 square meters. The height of the dome is 25 meters. Stalagmites and stalactites of various shapes may be found within, illuminated with mysterious lights to give off an ethereal appearance. It is best describes as a Cave inside a mountain in the middle of the ocean. The Dau Go Caves can only be reached by boat. The caving experience is just a day trip and the activities involve rock climbing and cave exploration. How to Reach: From Halong city, you will find a number of boats and ferries that will take you to the caves. If you are part of a standardized cruise, the cruise operator will take care of transportation to and from the caves. 'Tam Coc' literally translates into three caves. Tam Coc is a collection of three caves - Hang Ca, Hang Giua and Hang Cuoi. Each of these caves is submerged in the Ngo Dong Rivers and hence do not have floors. They can only be reached by boat from the mainland. The caves were created by erosion and the passage of time. There are an abundance of 'Stalagmites', strange and surprising forms carved in the rocks, wild vegetation and if you're unlucky, monkeys. Hang Ca cave is the first cave and the largest of the three. It is 127 meters long and its entrance is 20 meters wide and 2 meters high. The cave roof looks like a desert plain. Hang Giua is 70 meters long and Hang Cuoi is 45 meters long. These wonderful limestone karsts are definitely worth seeing. There are a number of 'sampans' or small boats available from Pier Van Lam. The entire cave exploration in the boats takes about four hours. How to Reach: There are frequent buses to Ninh Binh from Hanoi. The bus ticket costs between 70,000 - 100,000 VND per person. From Ninh Binh, you will have to take a taxi or a motorbike to Tam Coc. The entrance to the Hang Va caves seems nondescript, unimpressive even, but one step inside the cave will leave you breathless. Surrounded by valleys, a small collapse in a hill serves as the entrance to the Hang Va caves. The entrance is surrounded by cliffs on all sides. If descend about 15 meters, you'll find yourself at a stream. This stream continues to flow throughout the entire length of the stream three hundred and sixty-five days of a year. Upstream after about 350 meters, the narrow cave opens up into a spectacular chamber. The chamber consists of numerous dry gour lakes, partially filled water, out of which pops out conical calcite rocky structures. This region is called the 'Tower of Cones'. Oxalis is the only tour operator who operates in this area. The entire expedition to the Hang Va caves takes 2 days and 1 night and includes swimming and rappelling. The Phong Nha Caves were among the first caves to be discovered in Vietnam, and one of the most-visit caves here. 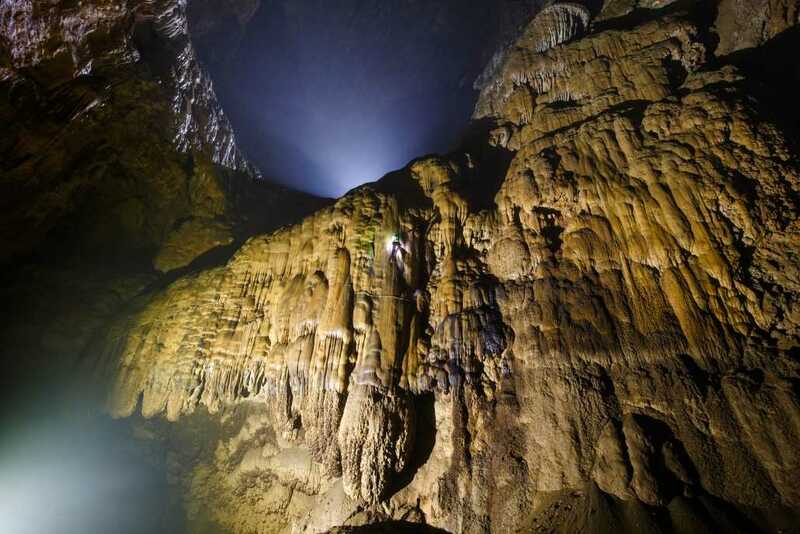 There is much variation in the topography of the cave, making it a delightful spot for caving in Vietnam, though only the first 1.5 km of the total 44 km is open to tourists. It is one of the few caves in Vietnam where you can find native wildlife, preserved in the sanctuary at the entrance of the mysterious cave. One must enter the cave by boat, sailing over the Son River that flows through this cave system. Inside, there is a twilight zone and a dark zone, each with its own mystical allure and enchanting beauty, covered in multiple stalagmites and stalactites that are beautifully illuminated by the lights all around. The waters of the cave hold exotic marine life like crabs, eel, shrimp and other aquatic species. The Phong Nha Caves may only be explored through verified tour operators. How to Reach: Phong Nha Ke Bang can be reached by Bus from Dong Hoi, (which has the nearest airport and railway station). It can also be reached by Bus from Ninh Binh or Cat Ba, or directly by renting a taxi or a motorbike. The only way to reach the Phong Nha Cave is through a boat on the Son River, which will be handled either by the tour operator or can be availed at the Phong Nha Tourist Centre. Nuoc Nut Caves provides the perfect opportunity for serious amateur cavers who are just starting off, to get a taste of the intense caving Vietnam's caves can offer. The Nuoc Nut caves are located right in the centre of a valley surrounded by cliffs. Once through the cave, you have to wade 500 meters, then scale a 15-meter high wall, after which you will find yourself at a stalactite lake. The stalactites found here are a unique pyramidal shape, which is found almost anywhere in the world. The expedition is for one day (day long) an includes swimming and relaxing on the sand. With such mysterious, large caves in Vietnam, it has quickly become one of the best caving areas in the world. Whether you are a seasoned player or a rookie who wishes to start off with this adventurous sport, caving in Vietnam will not disappoint. Cave Away!